"If this were a 'mere' coffee-table book showcasing Angell's birds, it would still be magnificent. But it is, first, a celebration of the Sound . . . and second, an inquiry into the artist s craft. There may be more visual artists who can write than writers who can paint or draw, but Angell is exceptional both as an observer of nature and at his own mind and hands work." "If you've lived here for any length of time, you've seen an Angell sculpture: in a public place, an art gallery or a private home. Puget Sound Through an Artist s Eye chronicles 40 years of the Seattle-area artist s sculptures and paintings of the birds, mammals, reptiles, amphibians and undersea life of our region. It s a summing up to date of Angell s career and a testament to the tenacity and inventiveness he draws on to pursue his quarry. And it s a cri de coeur for a halt to the degradation of one of the most beautiful and fecund places on Earth. As with the best coffee-table books, you can read the narrative straight through, or stop and linger over Angell s marvelous way with marble and chlorite, limestone and serpentine. This is a keepsake book -- a testament to an artist s passion for his work and for Puget Sound, his home and his muse." "To encounter Tony and the plenteous generation of sculptures that have come to cold yet fiery life is literally to see a world in the making. . . . And so we have, in the mighty circle of work that Tony Angell has bestowed on us across the past four decades, an orb of double importance. An everlasting sense of the Puget South country that is nature's blessedly varied kingdom, and within that a brilliantly preserved wingdom." "A wonderful book as Angell's superlative sculpture and exquisite drawings demonstrate how fine art can build a bridge of understanding to an extraordinary and still wild area that remains an important repository of some of the natural capital we depend on." "Puget Sound is not just a description of a geography, it is a place. Tony Angell's book brings home that place in all its mystery and splendor. This is why the people who live in the Pacific Northwest love it." "Tony Angell's sculpture is iconic. It transcends its subject matter in a way that all great works of art must do to resonate through space and time. A thousand years from now, people will still be awestruck by the power and beauty of these sculptures. Let us hope that the wildlife that inspired them will be with us as well." 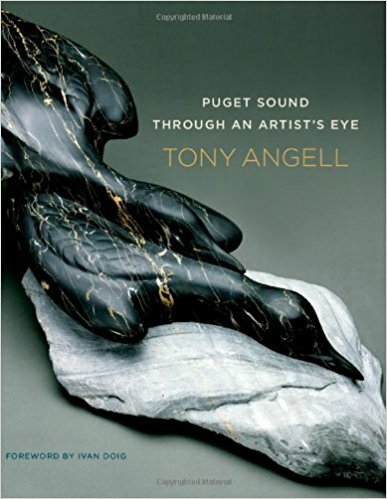 "In many ways, Tony Angell is Puget Sound. Through his writing, sculpture, and drawings, he artistically captures the Puget Sound environs better than anyone. If you have an interest in our region's birds, mammals, and marine life, dramatically depicted, then this is the book for you. Tony illustrates, explains, and provides a full understanding of each. This book is a 'must read' for all of us." "Less is more, and the way Tony is able to catch the character of his subjects by stylizing them makes him a true artist, exceeding the genre two hundred percent!" "Finding one's own voice, one's own authenticity, is perhaps the highest goal an artist seeks. In my estimation, Tony Angell has done this through his observation skills of nuances in the natural world and transformed them into shapes removed of all excess, leaving a form in pure, silent power." "More than a quarter of a century ago, Tony's art had already assumed a maturity that is reflected in this wonderful new publication: his pen and ink drawing had a feeling of sculpture, just as his sculpture has a feeling of drawings. In both, he captures not only the movement, but also the essence of the birds and mammals. Detail is of secondary importance. Elegance of line and a deep understanding of―and empathy with―the interaction of the animals and their environment are Angell's hallmarks." "Tony's subjects are living creatures far removed from basalt and marble. Life is their strength, and the challenge is to give to the stone and bronze not only a true outward likeness but an inner presence which radiates from it. This quality is there in all Tony's work, and comes from a deep knowledge of how birds and animals live, and through sharing their environment." "Tony Angell―Behold a gifted intellect, an eye that sees what ours do not, Under bold chisel and strong hand, stones awaken and dark metals leap."